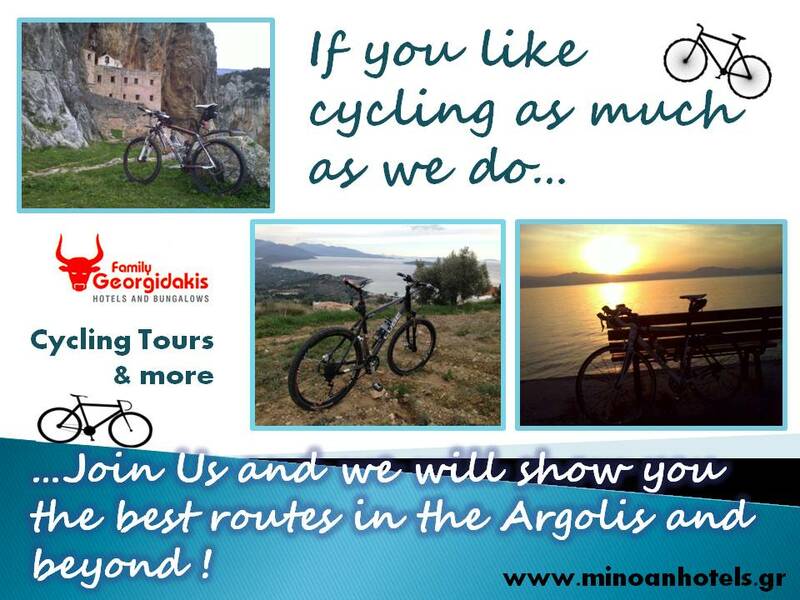 Cycling tours in Argolis ! If you enjoy cycling as much as we do, in Argolis you can find some great trails to stroll. Relaxed rides by the sea, secluded beaches where a car can’t reach and exciting climbs for all levels which take you to locations with breathtaking views . All this within a short distance from Tolo to discover on a bicycle. Bring your own bicycle or use one of ours. We will be happy to show you these places you will never forget. And when you return enjoy one cool dip in the swimming pool and a fresh fruit juice. Argolis is an area with long history. Traces of various civilizations are visible in most towns, villages and in places few people visit. During this historic process, the locals built temples and monasteries which were not only places of worship but depending on the occasion were also used as fortresses where local populations fled to protect themselves from invaders. Across the Argolis there are temples dating back to the early years of Christianity and others more recent ones which have yet linked their existence with significant historical events. Unique relics of great historical, religious and artistic value are kept in Monasteries and Churches of the Argolis. Magnificent wood carvings, Byzantine icons and paintings, gospels and other sacred books used for holy services. A trully unique heritage of the Greek Orthodox Church. To enumerate the historical temples and monasteries of the Argolis would take whole books. Some of the finest samples include the Holy Monastery in Aria Nafplio, the Holy Monastery of St. Demetrios in Karakalas, the church of the Panagia in Agia Triada, the historic church of St. Spyridon in Nafplio outside of which the first governor of Greece Ioannis Kapodistrias was murdered . In Nafplio there is also the Catholic temple of the Transfiguration which was built before the 14th century AD. Beyond the renowned temples and monasteries there are other religious sites that are unique, sometimes inaccessible. Some of these are the ruined monastery of St. Demetrius built around 11th century AD on a mountain near the village of Iria, the Church of the hidden Virgin Mary located over Karathona beach in Nafplion, the churches of St. George and the Transfiguration of the Savior on the edge of the valley of Didyma. Overlooking Tolo, on the top of the islet Koronisi is the chapel of the Holy Apostles and on the other island called Daskalio lies a small Byzantine church dedicated to the Virgin Mary around which there are medieval fortifications. 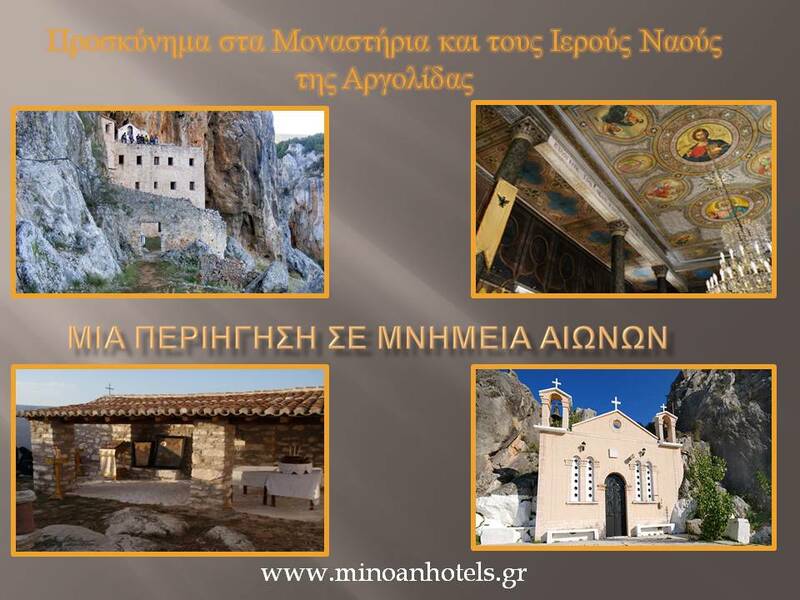 If you want to discover the historic monuments of Christianity in Argolis, our hotels are the perfect base. We will be pleased to provide you with all the necessary information and ensure you have a pleasant and relaxed stay. Carnival fiesta in Tolo !